Daenerys Targaryen surrounded by Dothraki. As well as a large measure of fantasy (so far there’s no evidence of dragons and ice zombies), George R R Martin and the HBO showrunners have drawn on history as inspiration for the Game of Thrones books and TV series. Much of the GoT world and narrative is based on medieval European and ancient Roman history, blended with numerous other periods and cultures. Nothing like a family wedding. 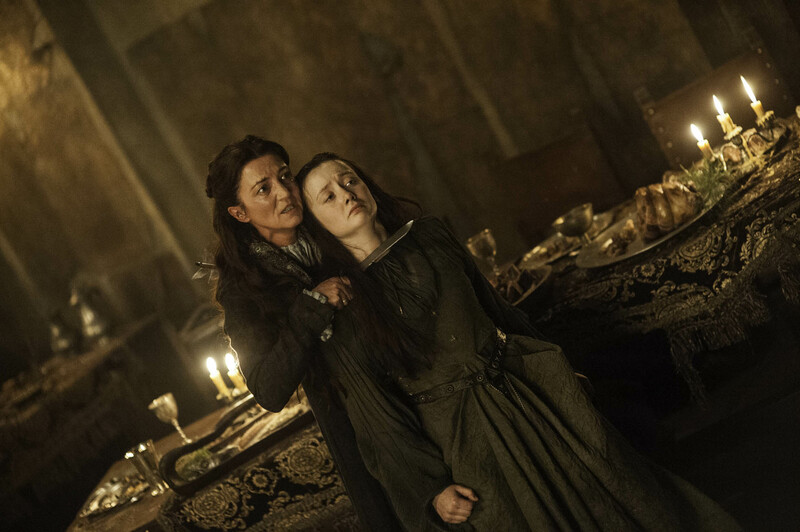 Catelyn Stark and Joyeuse Erenford at the Red Wedding. © 2016 Home Box Office, Inc. All rights reserved. HBO® and all related programs are the property of Home Box Office, Inc. The battle between the north and south has parallels with the Wars of the Roses, the Wall echoes Hadrian’s Wall, built to keep out the barbarians to the north, and the Red Wedding has roots in the bloody massacres of Glencoe and the ‘Black Dinner’, where guests were brutally murdered. Much has been written on these parallels already, so instead here’s a look at the real life nomadic warriors behind those wild horsemen, the Dothraki. Dothraki horde on the Dothraki Sea. © 2016 Home Box Office, Inc. All rights reserved. HBO® and all related programs are the property of Home Box Office, Inc.
George R R Martin has written that he based the Dothraki on an ‘amalgam of a number of steppe and plains cultures… seasoned with a dash of pure fantasy.’ There are certainly close parallels with the Mongols and the Huns. Some fans have already pointed out that Khal Drogo can be compared to Genghis Khan or Attila the Hun – great leaders who shared the ambition of uniting many nomadic tribes. But what about the people that came before the Mongols and the Huns? There are several similarities with another steppe culture – the Scythians, who may also have inspired the Dothraki. Who were the Scythians? 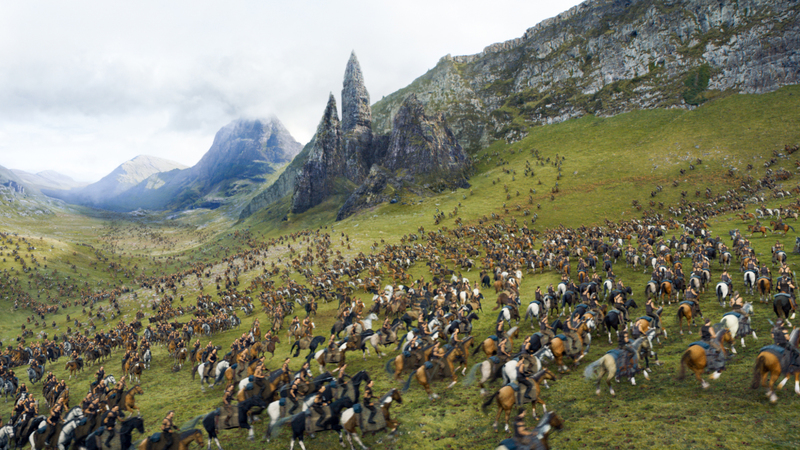 Well, they were fearsome, nomadic warriors who loved their horses – sound familiar? In many ways, they set the template for the Huns, Mongols and other nomads of the steppe as they were around first, flourishing from about 900 to 200 BC. Here are a few ways in which the terrifying Dothraki take their lead from the equally terrifying Scythians. 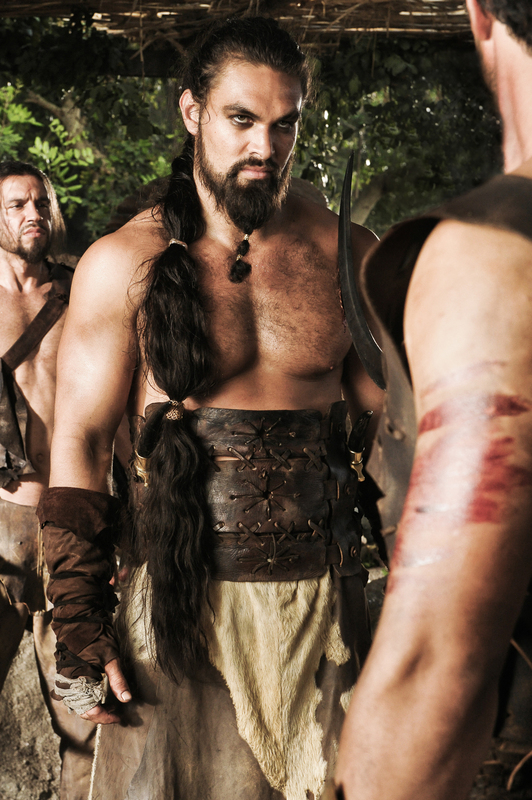 Dothraki warriors, thankfully not about to kill you. © 2016 Home Box Office, Inc. All rights reserved. HBO® and all related programs are the property of Home Box Office, Inc.
Gold sew-on clothing appliqué in the form of two Scythian archers. Part of their fearsome reputation comes from the perception among outsiders that the Dothraki and the Scythians are barbarians – Daenerys’ brother, who comes to a rather unpleasant end (in fact based on this totally real practice), regularly criticises Dothraki culture as being ‘savage’. Similarly the ancient Greeks perceived the Scythians as both terrifying and barbarous, while at the same time holding some respect for their brutal ways. Dothraki travel light and have light armour. © 2016 Home Box Office, Inc. All rights reserved. HBO® and all related programs are the property of Home Box Office, Inc. The visual representation of the Dothraki in the TV series owes much more to other cultures than the Scythians but there are still some interesting links. Men wore their hair long: the Dothraki men cut their long hair when they have been defeated, the Scythians cut theirs as part of a ceremony for the death of a king. They also both typically wear lightweight protection instead of heavy armour in battle to make them more agile. Interestingly, they both wore trousers, marking them out from other groups. However, vast stretches of where the Scythians lived can be extremely cold, so they were unlikely to be wearing as few clothes as Khal Drogo. 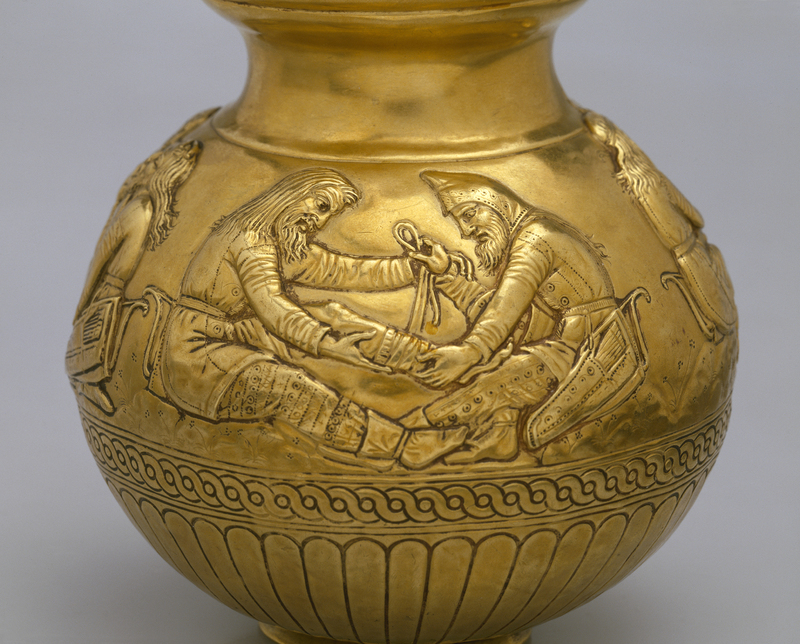 This gold bowl shows Scythians with long hair and trousers. © The State Hermitage Museum, St Petersburg, 2017. Photo: V Terebenin. The Scythians were not a united people but made up of a number of tribes with their own kings or chiefs. The Dothraki, too, are divided into several clans known as khalasars, led by a single leader, the khal. Khal Drogo. © 2016 Home Box Office, Inc. All rights reserved. HBO® and all related programs are the property of Home Box Office, Inc. The Scythian tribes did occasionally come together – Herodotus mentions tribes gathering for the funeral of a great king. 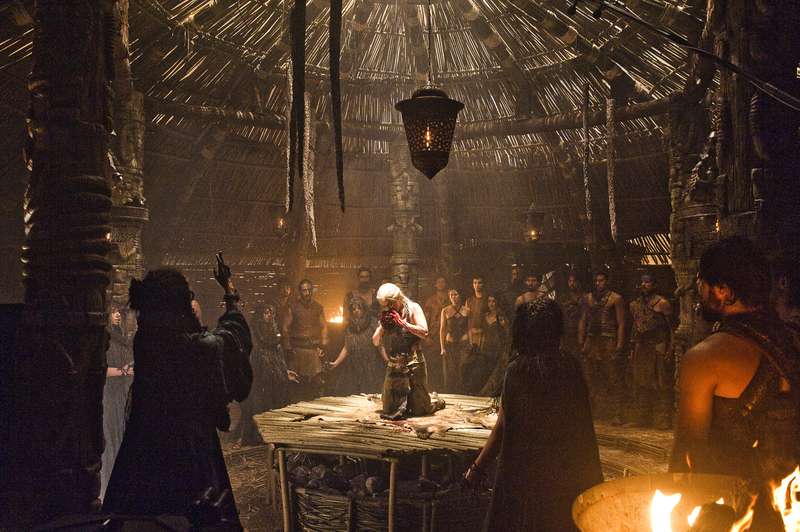 The Dothraki also come together in their only city, Vaes Dothrak, for special religious ceremonies. The role of women seems to be a point of difference between the two cultures. 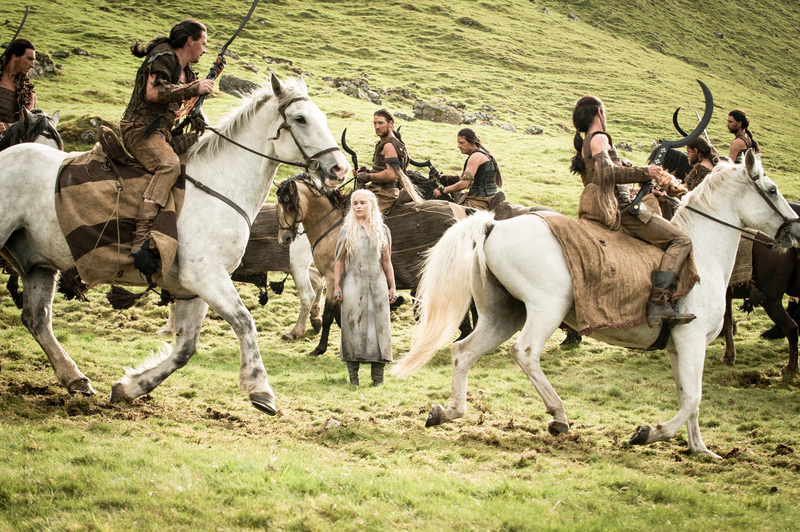 Dothraki women have limited role in society with little to no individual freedom. Even high status women – the widows of khals – are sent to live out their days together in a temple compound away from their tribes. Dothraki women symbolically reject warfare when they ceremonially refuse the wedding gifts of a bow, whip and curved blade – and give these gifts to their husbands. In contrast, Scythian weapons have been uncovered in female as well as male graves, and females have been found as if dressed for battle, suggesting that women were involved in warfare. Many experts think that Scythian women may have inspired the myth of the Amazons, the tribes of female warriors that so worried the Greeks. Daenerys as khaleesi. © 2016 Home Box Office, Inc. All rights reserved. HBO® and all related programs are the property of Home Box Office, Inc.
One example of a strong ‘Dothraki’ woman is the cult of leadership that develops around Daenerys. Although not technically Dothraki herself, she becomes the wife of a khal and her ambition, strength and leadership skills (as well as her amazing ability to walk through fire completely unscathed) lead the Dothraki to follow and even worship her. She also isn’t afraid to get involved in the fighting herself and the new pictures from season 7 seem to suggest that she will be riding into battle on her dragons. She certainly makes for a pretty awesome warrior queen – even by the standards of the Amazons. Spot the difference: the Dothraki Sea and the Scythian steppe. 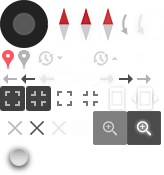 Dothraki image: © 2016 Home Box Office, Inc. All rights reserved. HBO® and all related programs are the property of Home Box Office, Inc. Steppe photo © The State Hermitage Museum, St Petersburg, 2017. Photo: V Terebenin. The Dothraki are nomads. In the books they are described as inhabiting a massive area of grassland in central Essos called the ‘Dothraki Sea’, very similar to the grassy steppe of Central Asia and Siberia where the Scythians lived. Both habitats are vast oceans of grassland, making it a harsh environment in which to settle down permanently. The Scythians travelled in search of resources, including fresh pasture for their horses. The Dothraki are nomads, like the Scythians, and lived in these tents. © 2016 Home Box Office, Inc. All rights reserved. HBO® and all related programs are the property of Home Box Office, Inc. Neither culture practised agriculture – the Dothraki even see it as sinful to cut the flesh of mother earth – and the Scythians traded to get the things that they couldn’t produce themselves. Both cultures stayed in tents and had portable belongings that could be packed up on horseback. 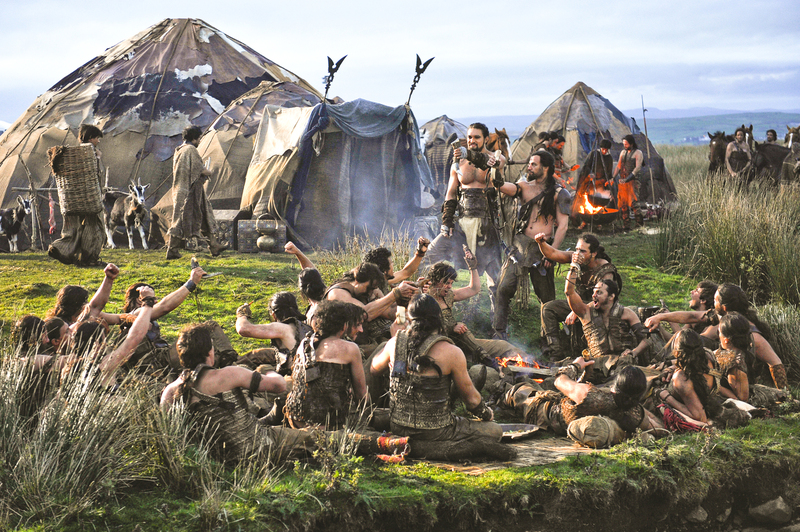 The Dothraki tents in the Game of Thrones series are similar to the large felt-covered tents used by the Scythians. 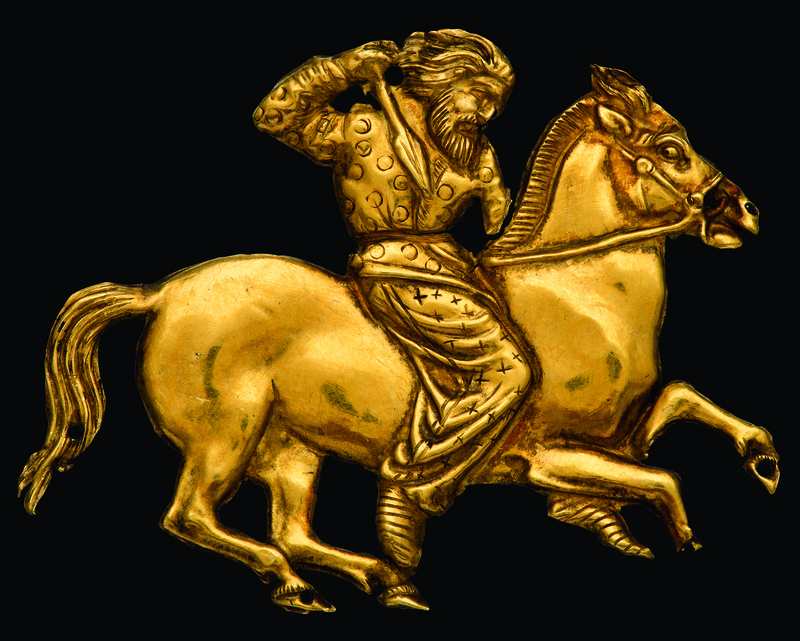 Gold plaque of a mounted Scythian. Black Sea region, c. 400–350 BC. © The State Hermitage Museum, St Petersburg, 2017. Photo: V Terebenin. 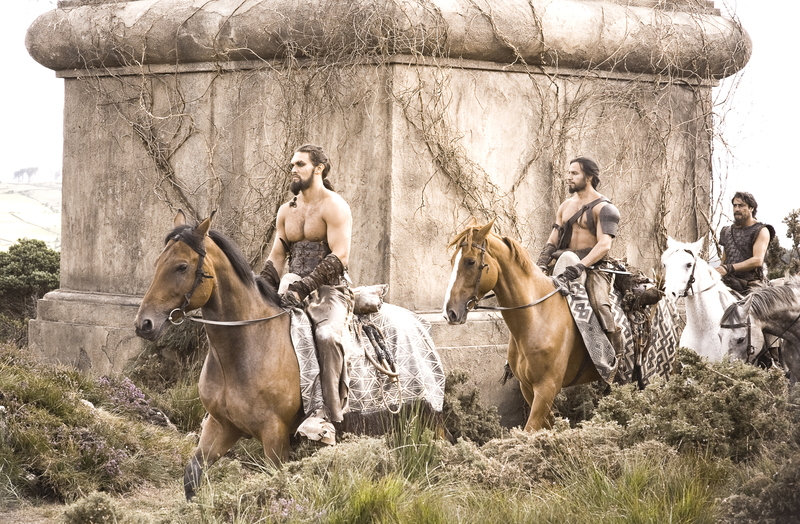 Horses are at the heart of Dothraki culture. They rely on their horses for food, transportation and battle, and worship a horse deity, the Great Stallion. In fact, the Dothraki are said to be born, fight and die in the saddle. 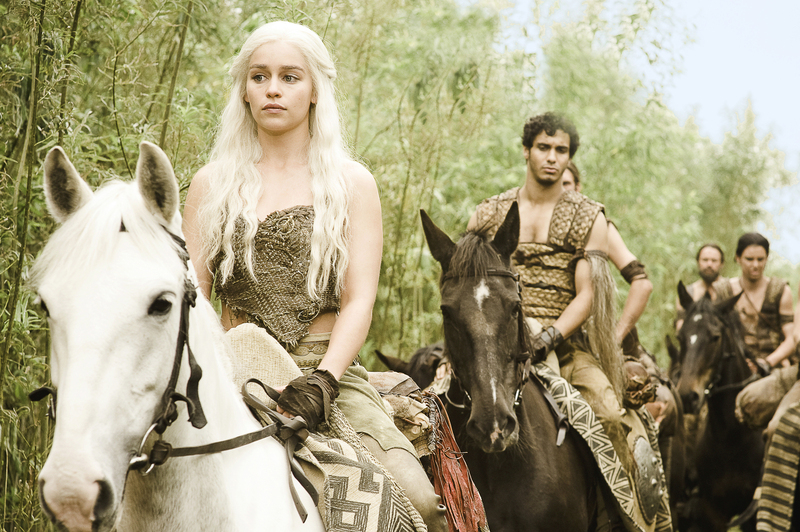 In their language ‘Dothraki’ literally translates as ‘riders’. Riding is also essential to social status – the Dothraki can abandon a leader who is too sick to ride, as we see with poor Khal Drogo. This reverence for horses is very likely inspired by the Scythians and similar nomadic cultures, as their lifestyle heavily depended on them. The Scythians were excellent horsemen and developed horse breeding to a new level. Horse remains uncovered by archaeologists show that prized horses were incredibly well cared for, living for 15 to 20 years. They also used horses for sustenance and like the Dothraki ate a diet of horse meat, washed down with fermented mares’ milk. An artist’s impression of a Scythian on a horse (reconstruction by D V Pozdnjakov) and Dothraki Khal Drogo. © 2016 Home Box Office, Inc. All rights reserved. HBO® and all related programs are the property of Home Box Office, Inc.
Scythian custom was to kill horses to place in the graves of the deceased. Excavated Scythian tombs have revealed amazingly preserved horses, which have been dressed for the afterlife with elaborate headgear and saddles. This is closely paralleled by the Dothraki custom of slaughtering a warrior’s horse when he dies, placing it alongside the body of their rider on the funeral pyre. In Game of Thrones we also see horses slaughtered as a sacrifice to the horse god. Who can forget poor Daenerys having to eat that heart from a freshly killed horse as part of a divination ritual? Horse sacrifice for ritual purposes also took place in Scythian culture. The Greek writer Herodotus says that the Scythians strangled and flayed horses before boiling the meat and offering a portion of the meat and entrails to the gods. Daenerys eats a horse’s heart. © 2016 Home Box Office, Inc. All rights reserved. HBO® and all related programs are the property of Home Box Office, Inc. So far, so Scythian. But what does fate hold in store for the Dothraki horde in the future? Only time (and watching/reading the series) will tell! As for the Scythians, you can discover more about their fascinating culture in a new exhibition from September 2017. Can’t wait until then? Find out more in this blog post introducing the Scythians. Game of Thrones Season 7 premieres exclusively in the UK on 17 July on Sky Atlantic and NOW TV at 02.00, repeated at 21.00 on the same day. 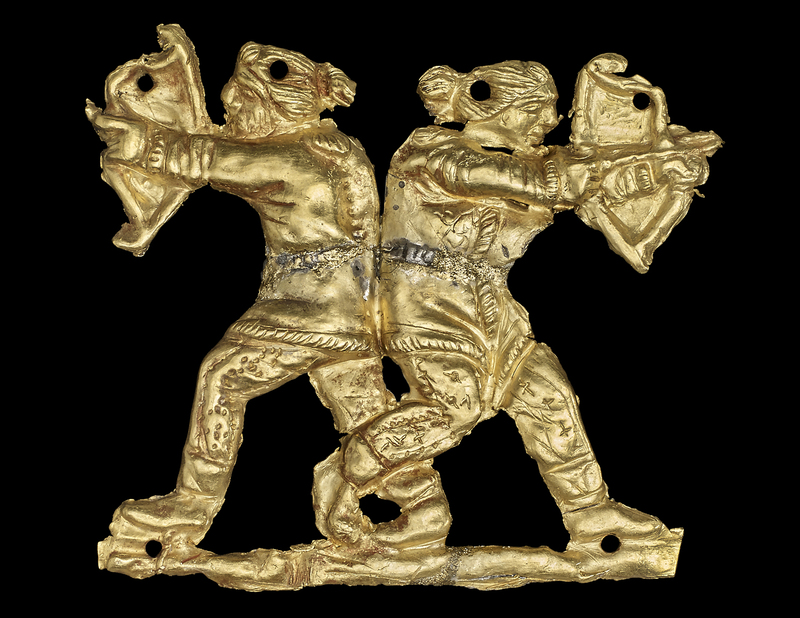 The BP exhibition Scythians: warriors of ancient Siberia is on at the British Museum from 14 September 2017 to 14 January 2018. Supported by BP.